Khadi herbal hair colours are absolutely natural. No preservatives, dyes, artificial colour or artificial fragrance used. Khadi herbal hair colours are the most natural way to give colour, shine, volume and long life to your hair. Dark Blond is cool, self-confident and is absolutely trendy. With this natural hair colour you achieve a unique, matte dark ash blond depending of your starting color: White or light hair turns to a light to medium ash blondness. 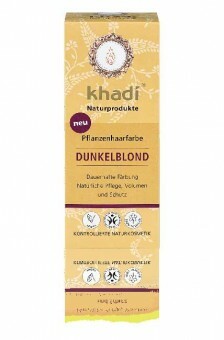 Dark hair receives a beautiful glow with Khadi herbal hair color Dark Blond. With Khadi Haircolour Dark Blond, you groom your hair while dying it. Effective ingredients such as pomegranate and black walnut provide a rich colour result in hip-ashy dark blond. Aloe Vera provides intense moisture. Khadi Hair Color is 100% vegan and free of synthetic ingredients such as ammonia, peroxides and parabenes. The herbal colour pigments are coating each strand of hair while strengthening it. Khadi herbal Hair Color Dark Blond gives you healthy, shiny, powerful hair. Application: First clean your hair with a silicone-free shampoo like Khadi Amla Shampoo. For highlighted hair, use Khadi hair oil before applying the colour. 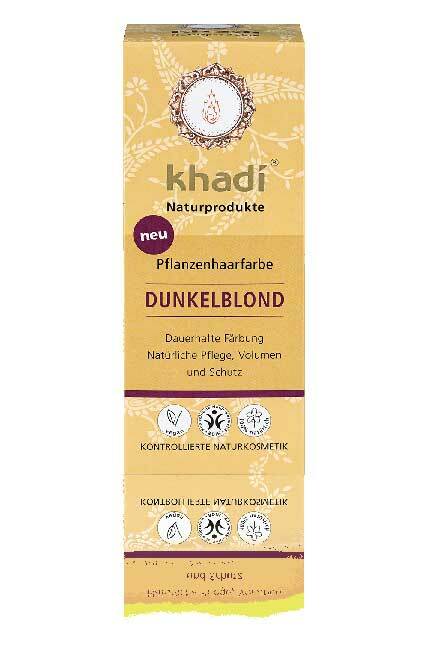 Khadi Golden Hint is ideal for the pre-treatment of light or blond hair for the Khadi haircolours Light Blond, Middle Blond and Light Brown. It is the only Khadi Blond nuance that is not permanent. Leave on for a maximum of 30 minutes. Mix the Khadi Hebal Hair Colour Golden Hint with 50 degrees hot water and stir with a whisk until it is spreadable. Use a brush to spread it evenly in your hair: Strand for strand - right up to the tips. If you only want to paint your hairline, spare lengths and tips. Leave in the natural hair colour for 30 minutes. The longer the Khadi hair colour stays in your hair, the more intense the gold accents - up to copper gold. If you want to cover up or neutralize violet reflexes, leave the Khadi plant hair colour on for at least 60 minutes. Then rinse with clear water - done. Do not use shampoo for 24 to 48 hours. This way the herbal hair colour shines in its full glow. If you then apply a Khadi hair oil and let it work for 20 minutes, you fixate the pigments - for a long-lasting colour experience. Note: Each hair is different - the way we are all different. Therefore, the results vary. We recommend you test the natural hair colour Khadi Golden Hint only on a single, discrete test strand. This product has been certified by BDIH.